Originally published in France between 1876 and 1888, Auguste Racinet's Le Costume historique was the most wide-ranging and incisive study of clothing ever attempted. 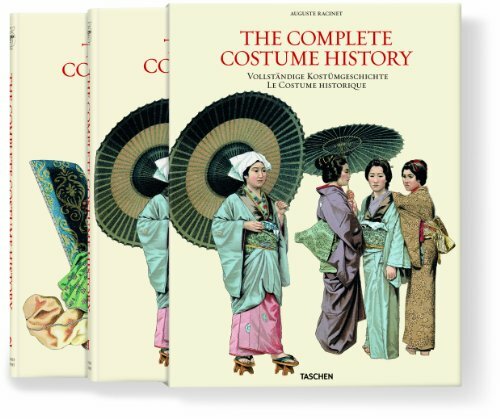 Covering the world history of costume, dress, and style from antiquity through the end of the 19th century, the great work—published in six volumes containing nearly 500 plates—remains, to this day, unique in its scope and detail. Racinet's organization by culture and subject has been preserved in TASCHEN's magnificent and complete reprint, as have excerpts from his delightful descriptions and often witty comments. Volume 1 contains all the plates from Racinet's work, reproduced in brilliant quality and showing the original's love for detail and color. Volume 2 collects the texts accompanying the images, giving descriptions and explanations, as well as the introduction by Françoise Tétart-Vittu. Perusing these beautifully detailed and exquisitely colored illustrations, you'll discover everything from the garb of ancient Etruscans to traditional Eskimo attire to 19th century French women's couture. Though Racinet's study spans the globe from ancient times through his own, his focus is on European clothing from the Middle Ages to the 1880s and this subject is treated with exceeding passion and attention to detail. Looks like a great reference book. Roughly how much of the content do the illustrations take up, and are they of a generous size? According to the information Taschen put out, the book's about the size of a 15-inch monitor, and it is 792 pages thick. As far as I remember (I looked at the book once in a bookstore) the illustrations take up the most part of the book. And it is a HUGE book.